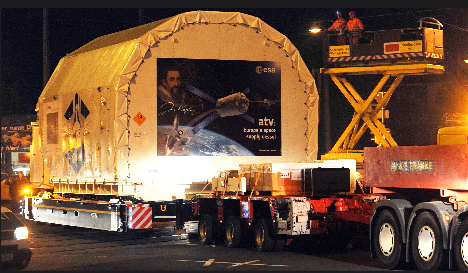 "Johannes Kepler", the second European spacecraft for the International Space Station (ISS), is on its way to the European spaceport in Kourou, French Guiana. The Automated Transfer Vehicle (ATV) has undergone extensive system testing at Astrium’s Bremen site over the last few months and has now been given the go-ahead for the final preparation stage prior to the cargo spacecraft's flight to the ISS. "Johannes Kepler" is slated for launch at the end of 2010. On behalf of the European Space Agency (ESA), Astrium is responsible for both the development and production of the ATV. 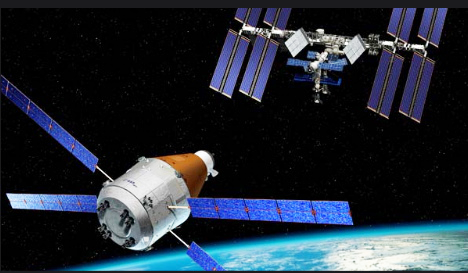 The production of ATV units two to five — as well as mission preparation and operations support – is covered by the contract, which governs the operation and provision of the European components of the ISS. Astrium is responsible for carrying out these activities on behalf of ESA. “Johannes Kepler” is the first production unit, following on from the highly successful first flight model “Jules Verne”, explained Dr. Michael Menking, Senior Vice President of Orbital Systems and Space Exploration at Astrium, as the ATV will set off from Bremen tomorrow. " At present, Astrium has orders for a total of four ATV production units from ESA, which is testimony to the high reliability Astrium has shown as ESA's prime contractor for the development of ATV and also the Columbus space laboratory. The extension of the ISS mission until 2020 presents Astrium with further opportunities in regard to both the supply and operation of the ISS. For example, two further ATVs will be needed for supply operations between now and 2020.” Dr Menking also confirmed that production of the ATV units is currently running according to schedule: Johannes Kepler is on its way to Kourou, ATV 3 "Edoardo Amaldi" has reached the integration stage in Bremen, ATV 4 integration is set to start shortly and ATV 5 is entering the equipment manufacturing stage. ATV must comply with the safety requirements for human spaceflight. Thus ATV’s digital and electronic architecture features double and triple redundancies. A fault-tolerant computer — consisting of three computer modules — ensures the reliable and smooth execution of the ATV mission. “Johannes Kepler” will be shipped in several parts to the European spaceport in Kourou, French Guiana, accompanied by 59 sea containers filled with test equipment. At Kourou's space port, final assembly will be performed on the spacecraft, Integrated Cargo Carrier (ICC), solar panels and the Separation and Distancing Module (SDM), which forms the interface between the ATV and the Ariane launch vehicle. The ATV will then be subjected to further extensive tests on site before being loaded, fuelled and installed within the payload fairing of an Ariane 5. “According to our planning schedule we will be ready to launch this second mission to the ISS at the end of 2010”, added Dr Menking. It is planned to produce the other ATVs in a program of one per year. With the ATV, Europe provides its contribution to supply the International Space Station. On a typical mission, the ATV carries water, fuel, food and scientific equipment to the ISS. Once its mission is over, the ATV is loaded with waste, undocked from the ISS and burns up during a controlled re-entry into the Earth’s atmosphere. The ATV is also responsible for regularly boosting the ISS to its operational orbit of around 400 km and performs manoeuvres to avoid collisions with space debris. The 20 tons ATV has a maximum net cargo capacity of up to 7 metric tons. The composition of this load can vary depending on the mission: 1.5 to 5.5 metric tons of freight and supplies (food, research instruments, tools, etc. ), up to 840 kilograms of drinking water, up to 100 kilograms of gases (air, oxygen and nitrogen), up to four metric tons of fuel for orbit correction and up to 860 kilograms of propellant to refuel the space station.